I made my first contribution to Drupal.org. It concerns redirections of login. I made my first contribution to Drupal.org. It concerns redirections of login. Login destination is a useful module for redirecting users after they logged in. You can redirect depending on roles, but I needed rules depending on which node the visitor was entering from. The traditional outbound marketing techniques of telemarketing, cold-calling, direct mail, holding trade shows and print advertising are becoming less effective. Buyers are simply tuning these messages out and ignoring them. Marketers are simply finding that 'interuption marketing' just doesn't work anymore. Buyers now have the capability to evaluate the products and services they need on their own. When a visitor lands on your website, did you know you have only 4-seconds to convince them that you have something worth looking at? That means if you've gone through all the effort of persuading them to 'take a look at you' then all that effort is completely wasted if what you show them is irrelevant to them, or is badly presented and off target. How many sites have you looked at, then sighed under your breath, shaken your head, and then moved swiftly on mumbling something about 'they just don't gettit do they ....'? More than a decade has passed since we first started repeating the mantra “content is king”. The funny thing is, back then we didn’t really know why, except that it was fairly obvious that blank or boring web-pages attracted no-one. Today we know that exceptional content is the absolute key to attracting prospects digitally and acquiring customers. 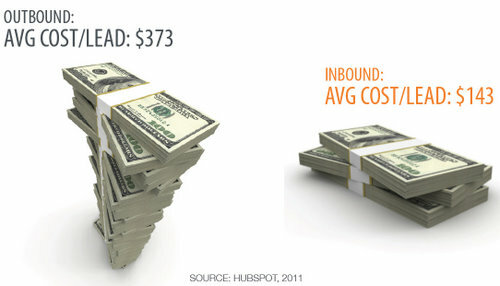 Inbound Marketing is the term, and it’s the science of generating leads online. By comparison, traditional marketing can also be called ‘outbound marketing’ where you rely heavily on salespeople, cold-calling, emailing, sending out collateral, advertising, branding etc. Activity and results can be sporadic and haphazard as effort is expended dashing up blind alleys and back-tracking. The idea from Inbound Marketing is to attract eyeballs from search engines, the quality of your content and from social media, and then when you have them on your site, you ‘capture’ them or start to lead them deeper into your lair with subtle ‘nudge marketing’ tactics, but that discussion is for another day! It isn’t just clever Search Engine Optimisation (SEO) or content alone anymore that wins the traffic. Blogs, articles, videos, white papers, webinars all have their role to play. Twitter, Facebook, blogs, forums and social news websites are the new destinations and meeting places for today’s buyers and influencers. With an increasing number of companies integrating social media activities as part their overall marketing and PR strategy, it is important that as part of this strategy brands also focus upon the importance of effectively managing and monitoring the potential risks involved. Due to the sheer growth in conversations and user-generated content, by its very nature social media leaves brands and users open to a number of risks as well as opportunities. As a result, the need to be proactive, identify possible risks ahead of time and develop an appropriate social media monitoring platform and process is key. Additionally, the integration of an effective internal management platform is also important, to ensure user access to accounts is coordinated and utilised in the right way, clearly communicating social media guidelines and allocating resources within the organization more efficiently. In light of this, below are three ways that companies can approach managing social media engagement and risk in the social media sphere. Many companies are adding twitter to their Social CRM arsenal and if used properly can warrant a lot of success. It’s easy to see the value in Facebook and blogging, but some people struggle in finding the worth of 140 characters. Before you can start your customer contact, you need to understand the realm of Twitter, what is expected and ultimately, what works. After all, you wouldn’t just put any old text on a billboard. There is marketing and research that goes along with any advertising and tweeting should be no different. In 2009 we saw exponential growth of social media. According to Nielsen Online, Twitter alone grew 1,382% year-over-year in February, registering a total of just more than 7 million unique visitors in the US for the month. Meanwhile, Facebook continued to outpace MySpace. So what could social media look like in 2010?